With all that is going on I mentioned I might not be writing regularly, but I am going to try. 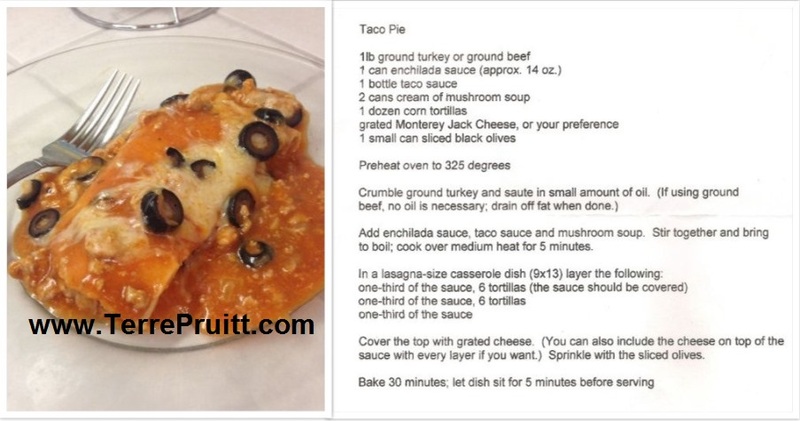 This might be considered a cheat because it is not an actual recipe. But that is really how I cook anyway. If you have read any of my blog posts that have recipes in them you probably know that I love leftovers. Recently I made Persimmon Chicken. We had it for a few days. There was enough for us to have a piece of chicken for a couple of nights. But the third night there was that odd piece left. Whenever I have an odd piece of meat that is usually when I throw it in pasta, in a tortilla, or on a tortilla. 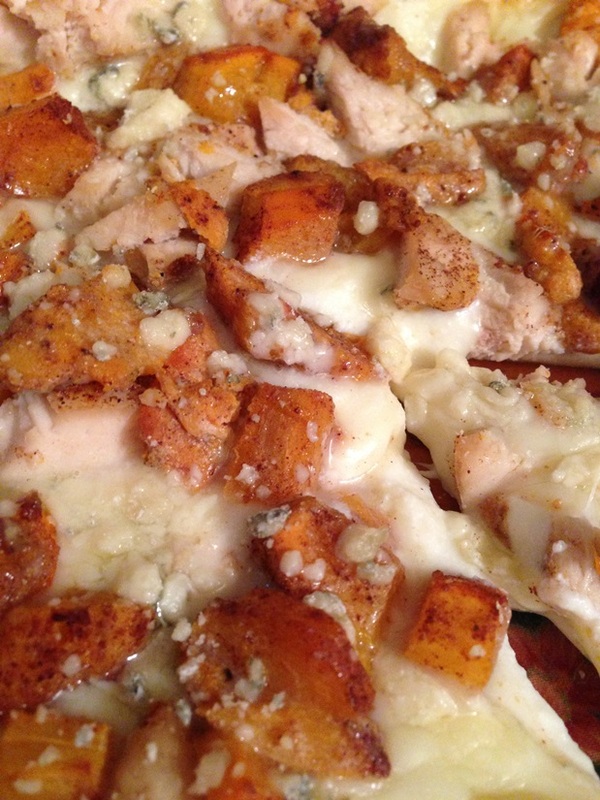 Well, I didn’t know how persimmon chicken would taste on a tortilla. But then I thought, “Why wouldn’t it work?” Well, I have to say, it worked and it was delicious! The sweet of the persimmons with the saltiness of the cheese – very good! You might remember that I went to a restaurant once and they served what I call Fancy Toast. I was thinking of that when I put together our persimmon chicken tortillas. Sweet and salty! 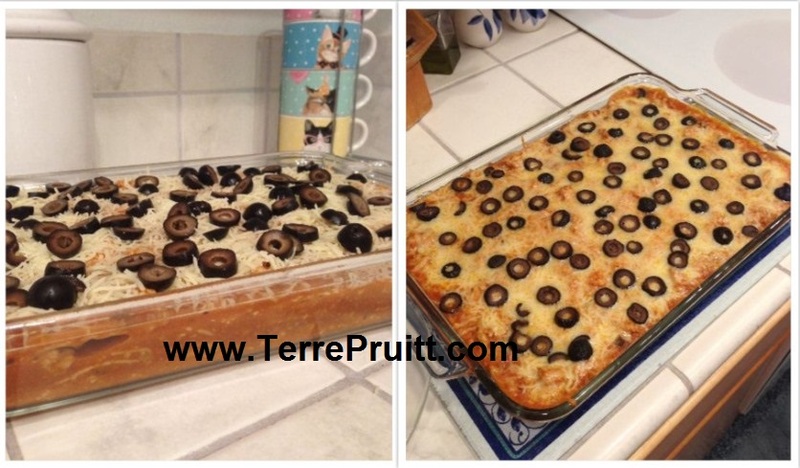 I had some leftover ricotta from the lasagna I recently made (that recipe is here). I decided to use it. 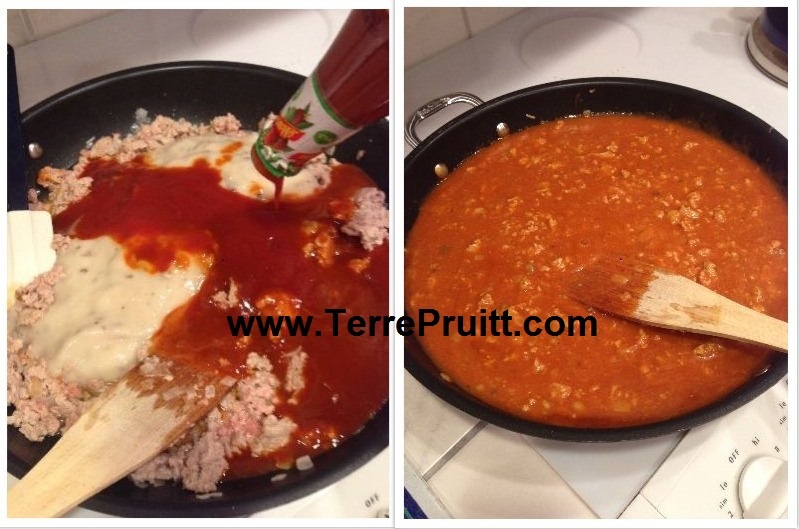 I am always looking for ways to use what I have and not let things I used for one recipe go to waste. Here is what I did. 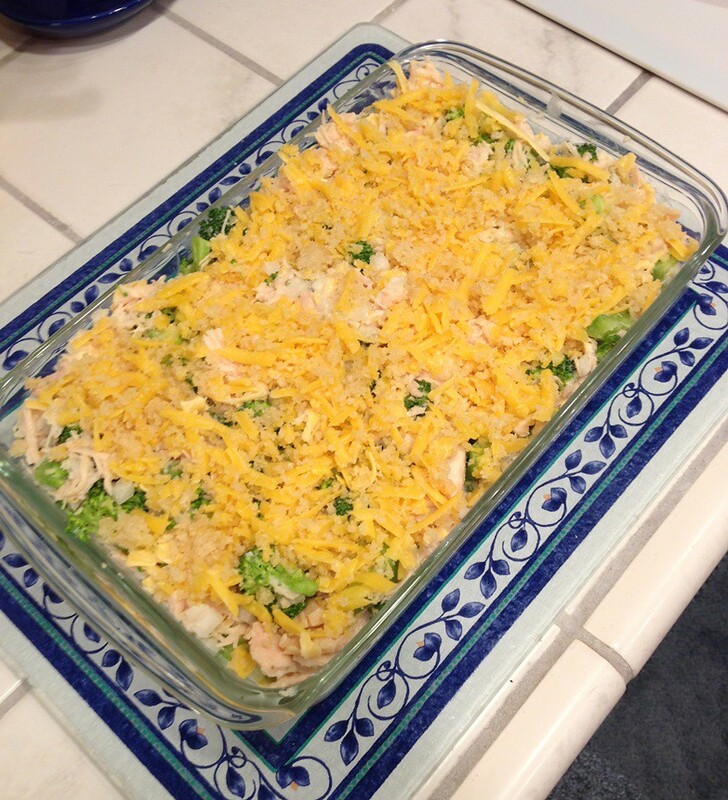 Preheat oven to 350° F. Cut up the chicken so you have little pieces. Spread the ricotta on the tortillas, 1/2 cup each tortilla. 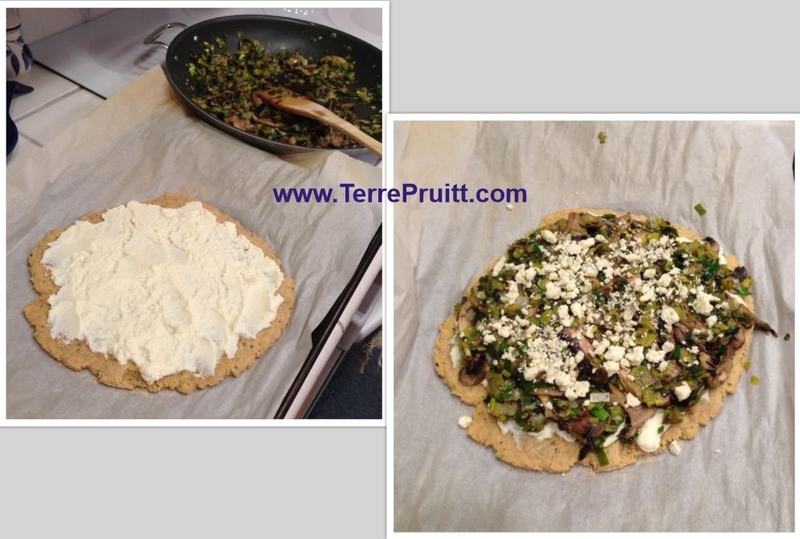 Then sprinkle 1/2 cup of the mozzarella on each tortilla. 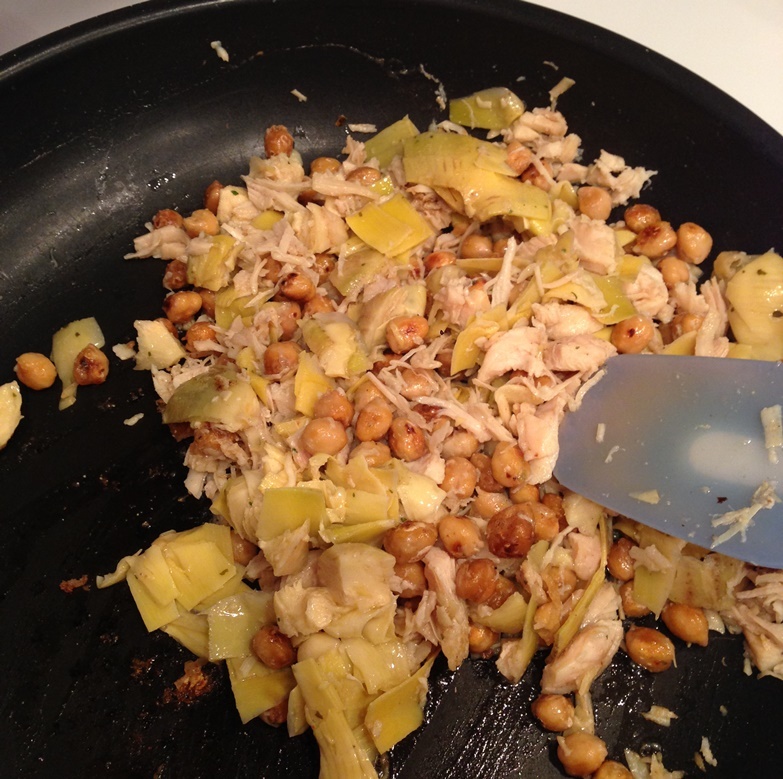 Distribute the cut up chicken over each tortilla along with the persimmons. 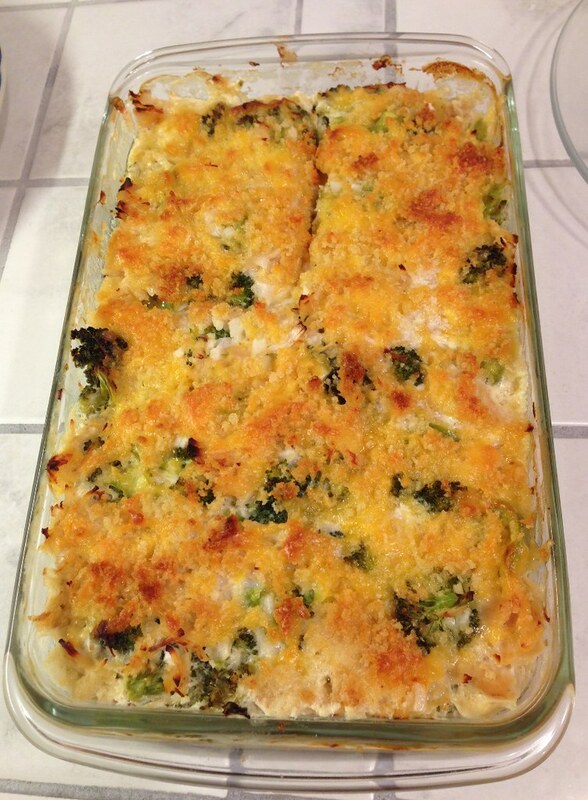 Then top with the gorgonzola – about 1 1/2 tablespoon each. Then bake it in the oven for about 20 minutes. You are really only trying to melt the cheese, as the chicken is already cooked. If you like your tortilla a little crisper, then bake it for longer. As happens more often than not, I was not planning on posting this on my blog. And I didn’t take a picture of the preparation . . . but I think it is simple enough you can get the idea. In the pictures I did take you can see the gorgonzola. The salty blue cheese and the spiced fruit were a great combination. The ricotta being somewhat flavorless just added great texture – a perfect creaminess. It was really good. 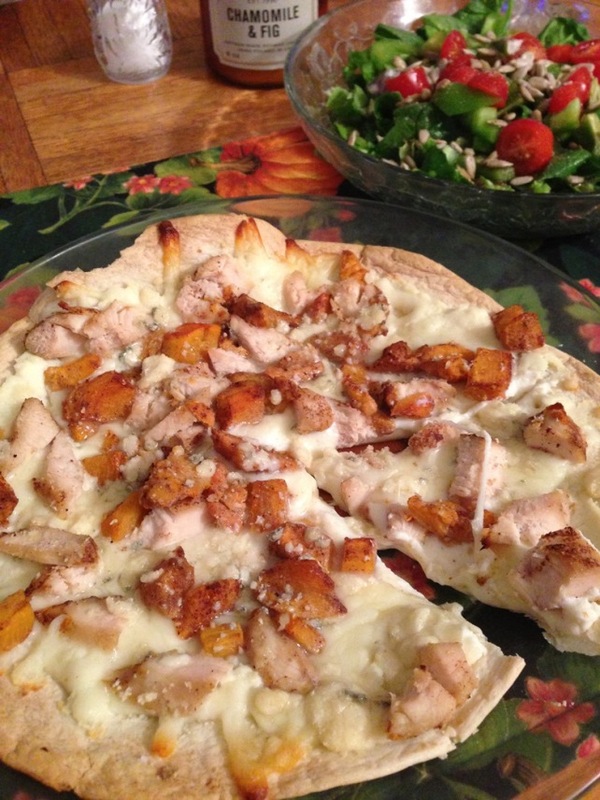 Next time I make persimmon chicken I am going to make sure I have enough leftover to do this. Plus I will make sure I have mozzarella, ricotta, and gorgonzola on hand. Although a mild cheddar might due in place of the mozzarella. What do you think? Sound good to you? What could we add to make it even better? So I had an idea to make another dinner with polenta but it was kinda like the last thing I made with polenta, but I was hoping it would be different enough I could add it to the list of things to make. 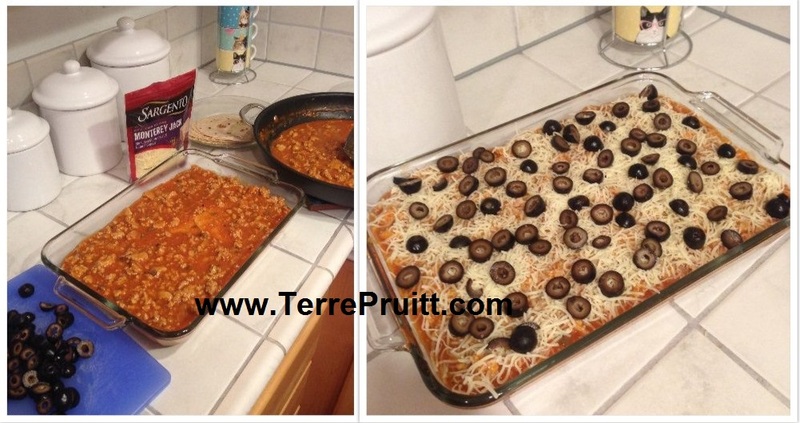 But it actually turned out to be almost exactly like the Turkey And Polenta Bake I had made. The polenta I buy is in a tube, like a roll of sausage, But it is hard, not mushy. I was still thinking I could roll it out so that I could put the rolled out rounds of polenta in muffin pans then fill ’em. But the polenta did not flatten when I tried to roll it out, it just started breaking up. So, I ended up just putting the sliced rounds in the bottom of the muffin cups. 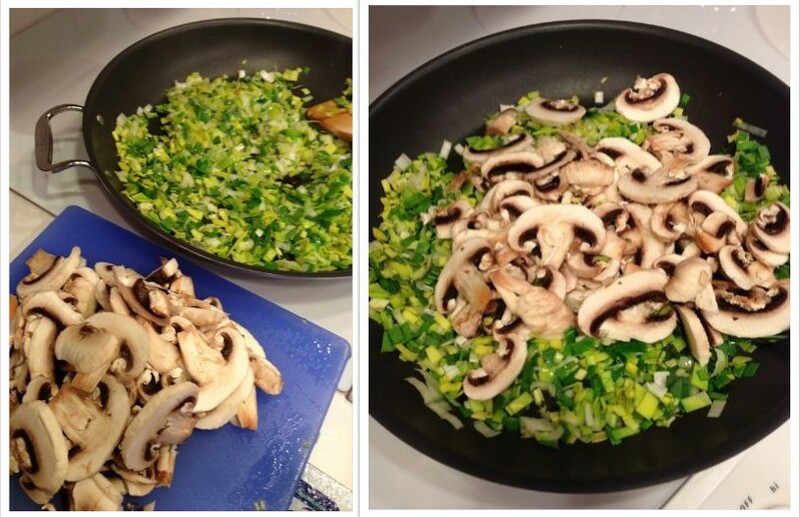 Chop the leek and slice the mushrooms, then cook the leek for a few minutes in the olive oil over medium heat. Then add the sliced mushrooms to the pan, add half the garlic and half the salt – reserving the rest for later (when you add the meat). Continue to cook and stir, then add the rest of the spices. While the mushrooms and leek are cooking, preheat the oven to 425° F. Then slice the polenta. I sliced mine so I would have enough to fit into both my pans. One isn’t even a muffin pan. Grease the muffin pan. Then put a polenta round into each muffin well. Brush some olive oil on each round. 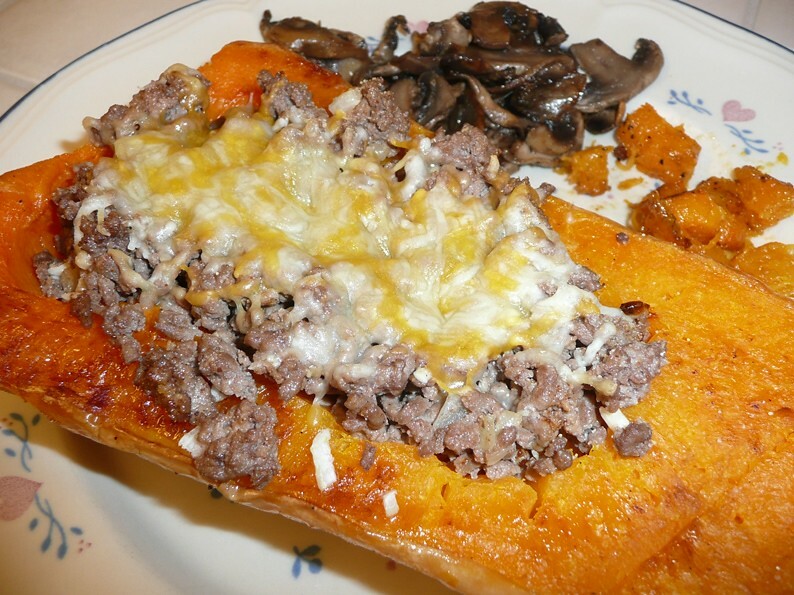 Bake the polenta for 15 to 20 minutes. Check on them. I wanted mine to have cooked to where the edges were getting crispy. Back to the mushrooms. 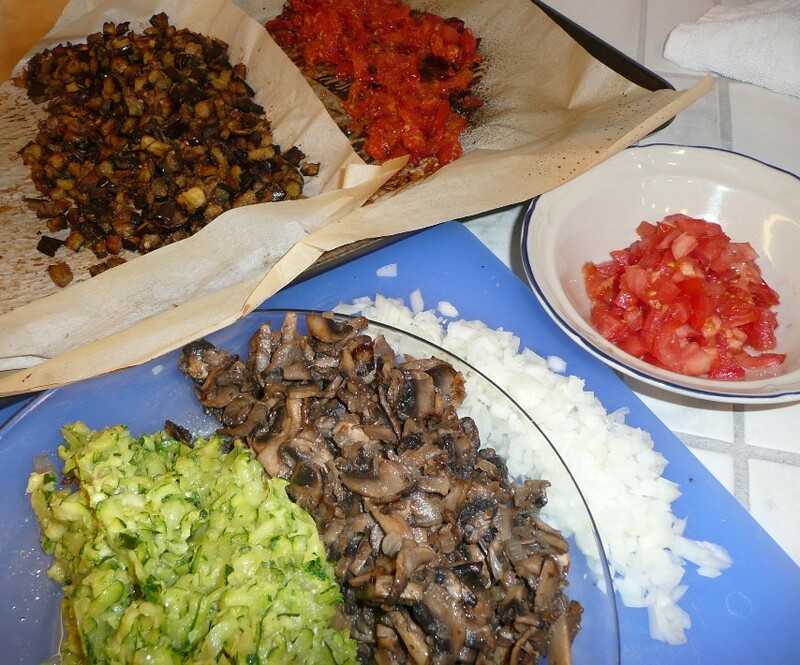 Cook the mushrooms until they are almost done – you decide how done you want them – then add the meat to the pan. Cook the meat a bit, then add the rest of the garlic and salt. Cook the meat until it is pretty much done, but don’t overcook it because it has to be in the oven a bit still. Once the meat is cooked to your satisfaction, put a tiny bit of cheese on the polenta, then fill the muffin cups (on top of the polenta) with the meat veggie mixture. 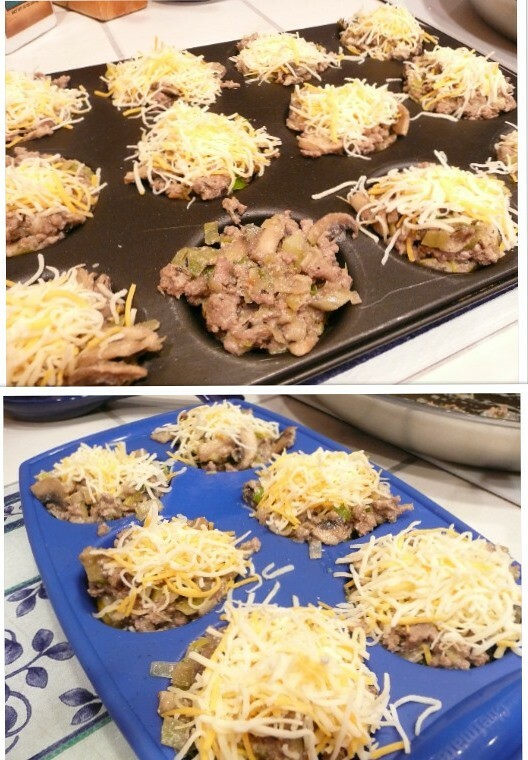 Top each meat filled cup with cheese, then bake for 10 to 20 minutes. 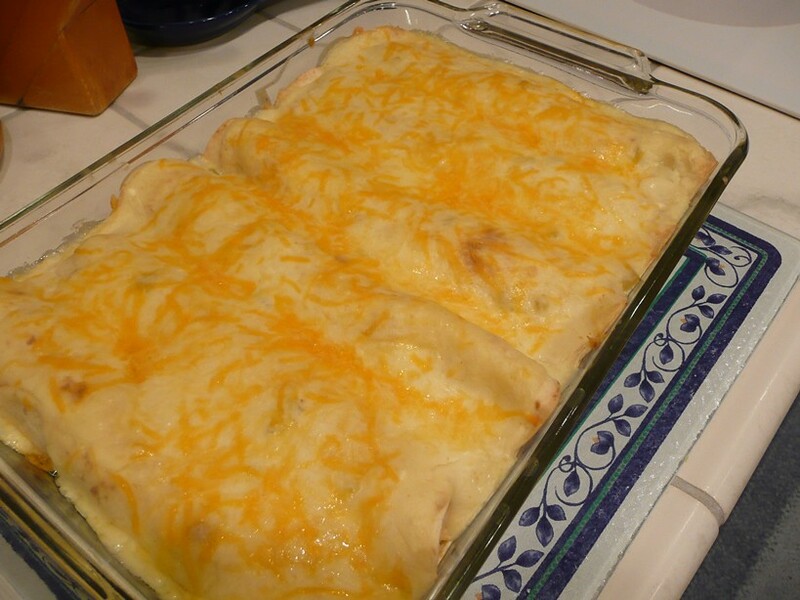 You can top them with sour cream and green onions. I forgot to buy one (sour cream) and I forgot to use the other (green onions). This was good, but it was not what I had planned and it was so much like my other dish I almost didn’t post about it. I liked it better though because the polenta was “crispy” and that is what I had wanted in the other recipe. This one was also good because it was different flavors than “taco flavor”. My plan – aside from rolling out the polenta, was to use corn and peppers, but we received two leeks in our produce box and I need to start using the produce right away, so I decided to use the leek instead. 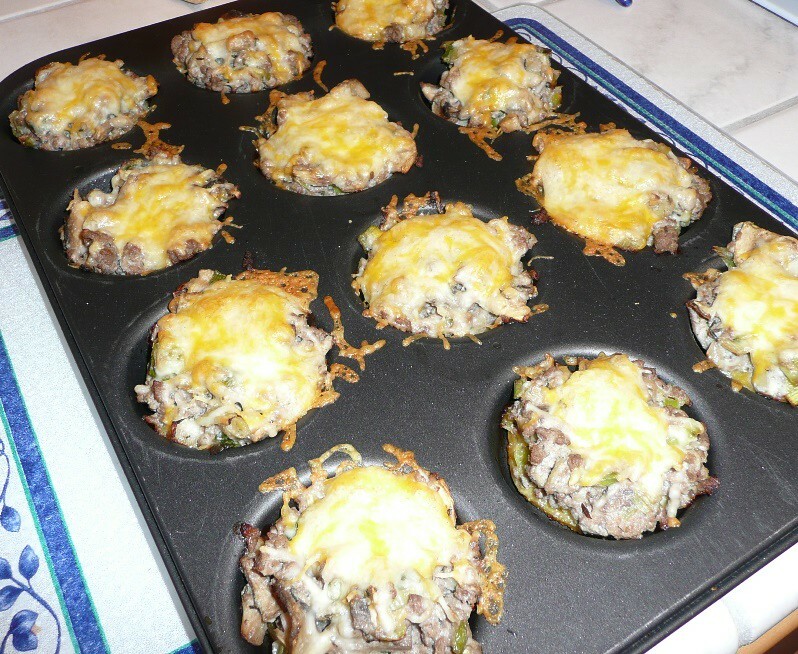 I didn’t think there would be enough room in the muffins cups to hold meat, mushrooms, leek, corn, and peppers. Perhaps next time I’ll do the corn and peppers sans leeks. My plan was also to start cooking earlier and take pictures of every thing, ingredients, and each step, but I started late and was on the phone while I was cooking so I almost forgot about the pictures. So what would you put on your polenta rounds? 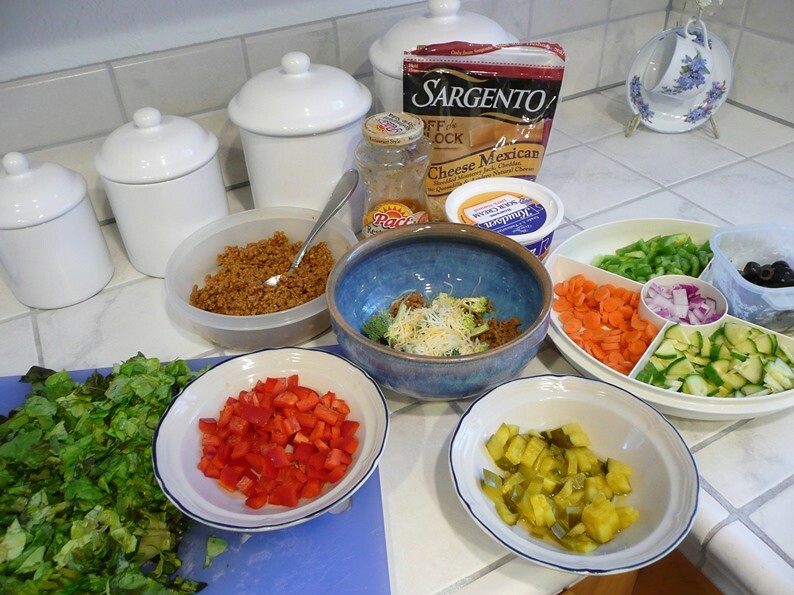 What do you put in your taco salad? Do you eat taco salad? Taco salad is one of my favorite meals. It is probably one of my favorite meals for several reasons. 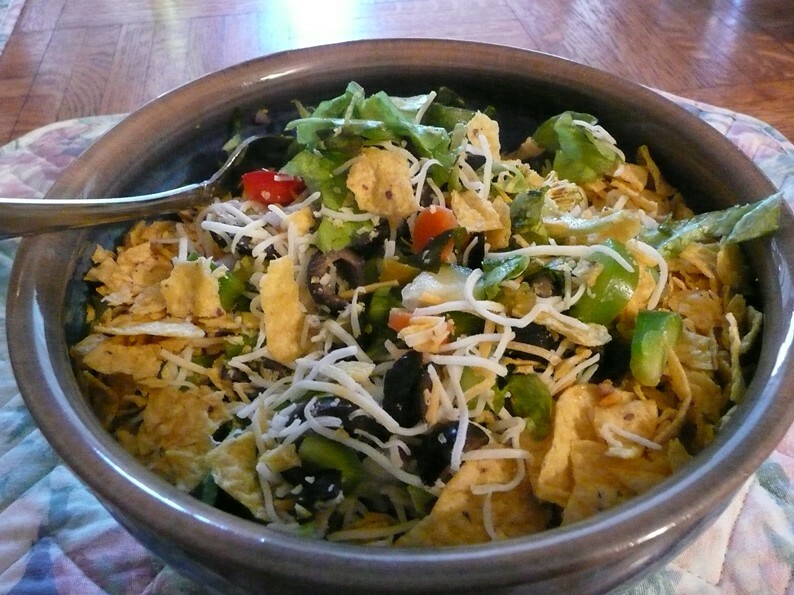 One reason is it is raw veggies and meat with tortilla chips, that is just a winning combination to me. 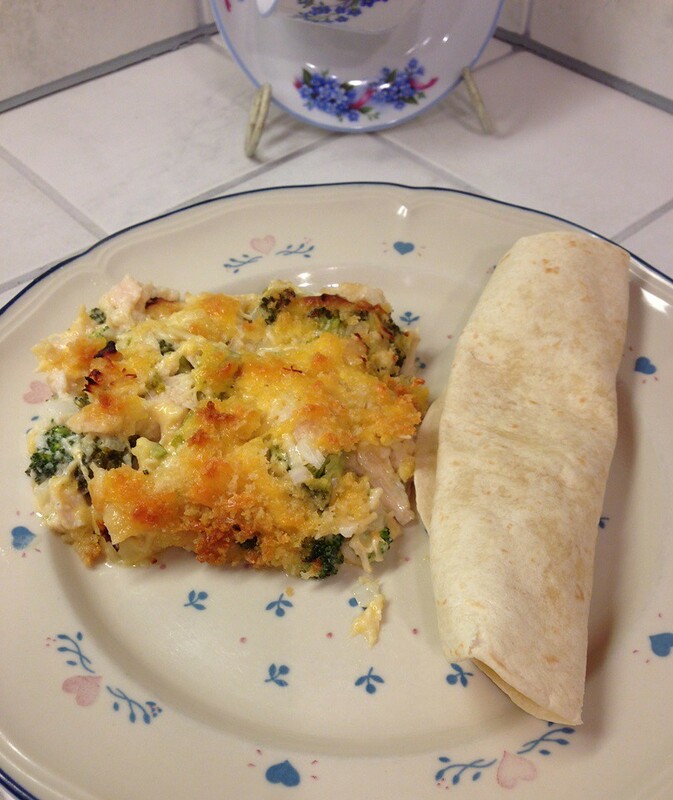 Another reason is when we have it, it usually translates into at least two meals — you know I love leftovers. And another reason is, usually when we have it my husband has made it. I had taco salad with my friends once and they laughed at me because the only thing “taco” about my taco salad is the tortilla chips and the “taco seasoning” in the meat. Since I was the one that started making the taco salad in our relationship I have “infected” my husband with my idea of or the way I make taco salad. We do it a little different. Cook the meat with the seasoning. You can use the directions on the package or not. I don’t, I saute some onions then add the meat. While the meat is cooking I put in the seasoning. My hubby follows the directions on the package. Whatever works for you. The lettuce is chopped or the kind from a bag. The olives are chopped or sliced, either by you or that is the way you bought them. The onions . . . I like red, but whatever color will do, even scallions. Whatever they are they are chopped. Pickles are chopped. So are the bell peppers, cucumbers, broccoli, and carrots. Then you just layer it in your individual bowl. My husband and I do ours individually since we both like different things in our salads. We also do our layers differently. Then he adds salsa and sour cream. I don’t add any of that. We both crumble our tortilla chips on top. One time I forgot them. I remembered them after I was half way through eating my salad. As you can see there are no beans. I don’t like beans, so I have never put beans in my “taco salad”. 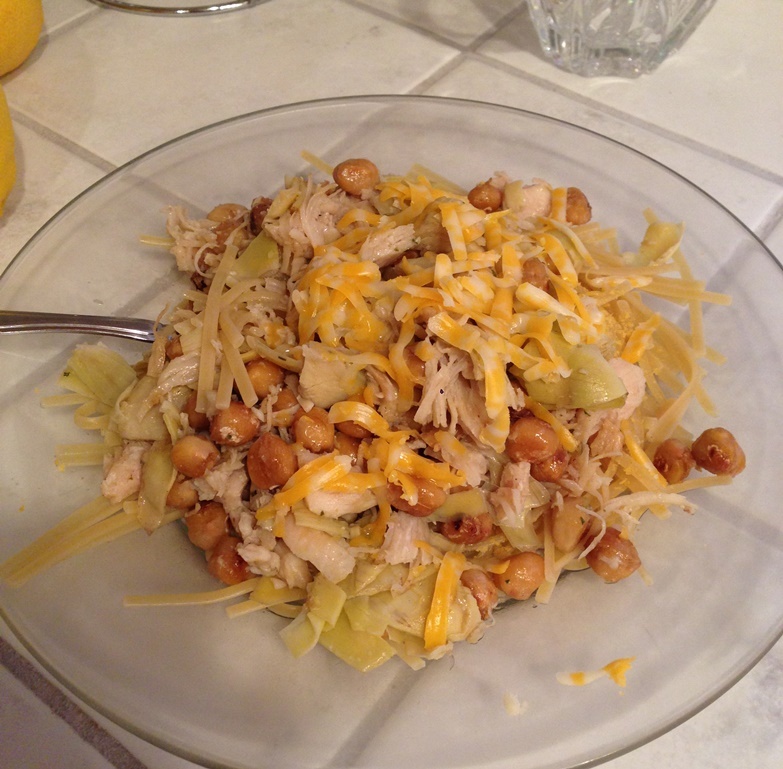 And, like I said, since I have always made it like that my poor husband doesn’t get beans in his salad. I don’t know if he would like them, but we don’t think to get them. Also, I believe pickles are a weird ingredient for a taco salad. I cannot tell you how that started. It might sound odd, but it works really well . . . I think. For me it is a MUST, the pickles are a source of moisture for my salad since I don’t add any dressing, salsa, or sour cream. I believe we have had tomatoes in our taco salad before. Basically any veggie that we would put in a salad we could add to our taco salad. The first nine ingredients on the list are the “must-haves”. Do you eat taco salad? 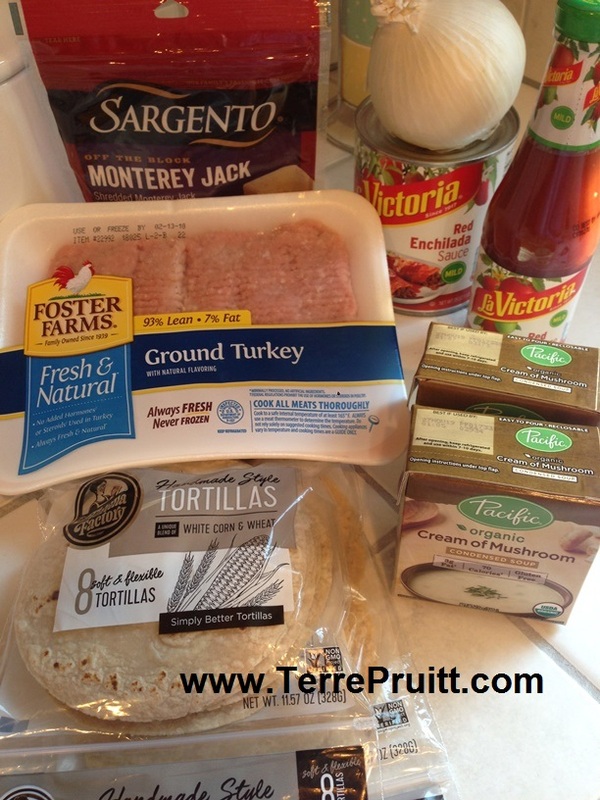 What do you put in your taco salad? Put the eggplant on a baking sheet. (I used parchment paper on the baking sheet.) Drizzle with olive oil. Mix it up, then spread the eggplant evenly, in one layer (the eggplant I used was too large to be one layer), over the baking sheet. After baking for about 10 minutes, move the eggplant around on the pan. After another 10 minutes, gently stir/toss the eggplant and sprinkle with garlic salt. Bake for about an additional 25 minutes. Stirring or tossing if necessary to ensure even roasting. In between roasting the eggplant, spread 3/4 of the tomato out over a baking sheet. (I used parchment paper on the baking sheet.) Drizzle with olive oil and sprinkle with garlic powder and onion powder. (Tomatoes are too delicate to be mixed as done with the eggplant.) Bake until the edge pieces are browning. Stirring gently, if you want. I ended up cooking the tomatoes for about 30 minutes. Somewhere in between cooking the mushrooms and zucchini as instructed below, you might want to cook your pasta. I prefer my pasta hot. You can plan and cook accordingly. While the other vegetables are baking, heat some olive oil and 1/2 the chopped onion in a pan. Add the mushrooms, season with salt and pepper as desired (I use garlic salt) and cook to your liking (I like them a little caramelized). 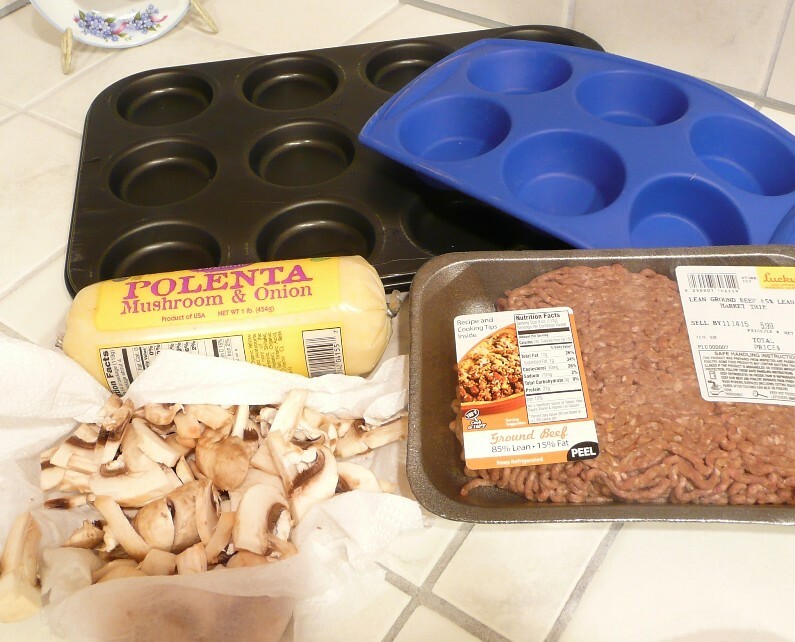 Remove from pan and set the mushrooms aside. Add two tablespoons of butter to the pan. Once the butter is melted add the grated zucchini. Cook the zucchini about 10 minutes on medium heat. Once all the veggies are cooked to your satisfaction put half of the cooked and drained pasta in a large bowl, then add half of all of the cooked vegetables. Add the basil, vinegar, any additional salt and/or pepper you desire. 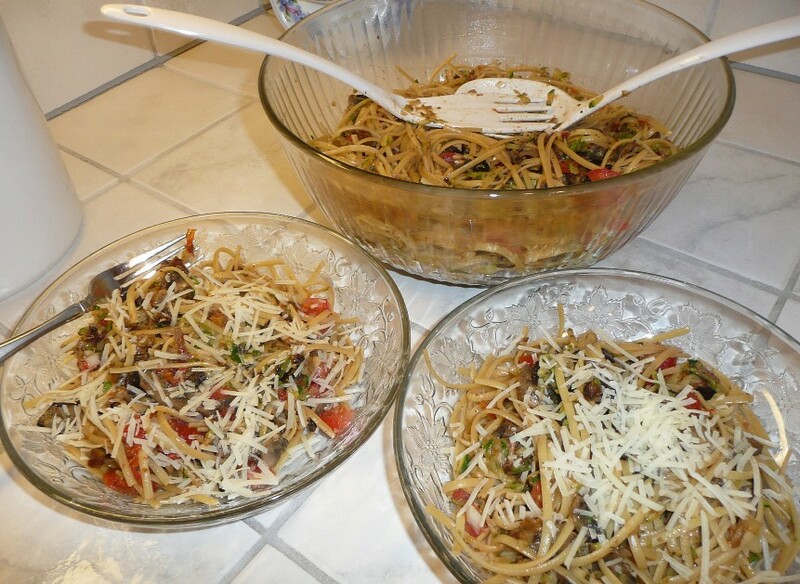 Then add the rest of the pasta and cooked vegetables along with half of the raw tomato and onion. Toss it all. Taste it to see if you want more basil, vinegar, salt and/or pepper. Put the rest of the raw tomato and onion on top. Serve the pasta sprinkled with Parmesan cheese. This is the first recipe I wrote FIRST, then followed. 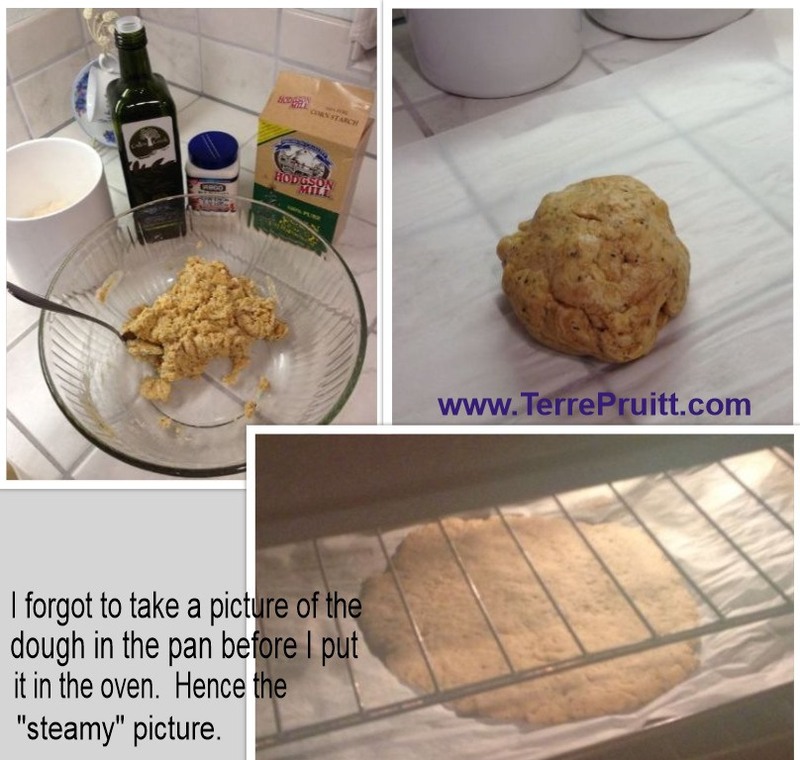 I made a few adjustments to the recipe as I was cooking, and noted them before posting. 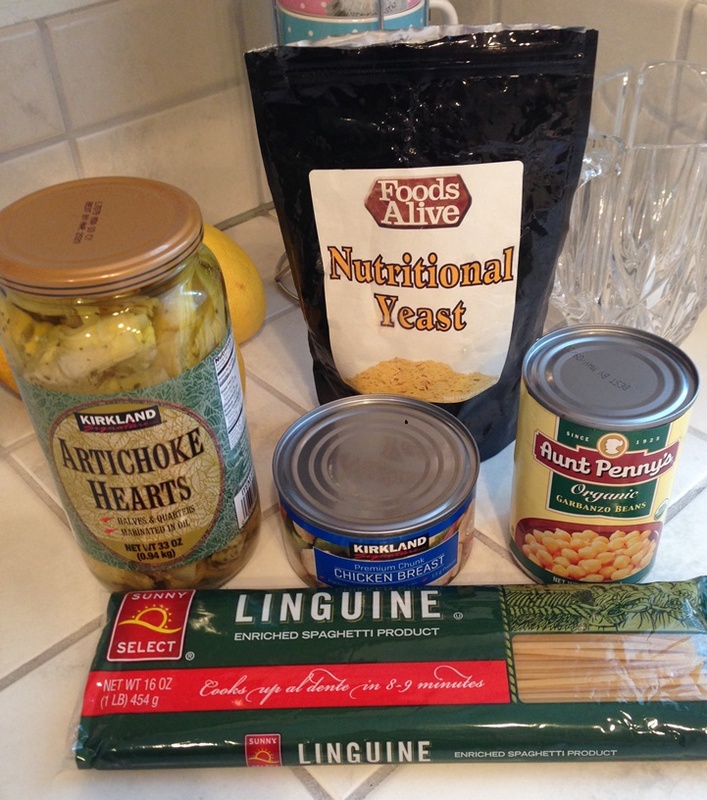 I think layering the pasta, then veggies makes for easier mixing. Of course, you can mix it anyway you’d like. I loved this. 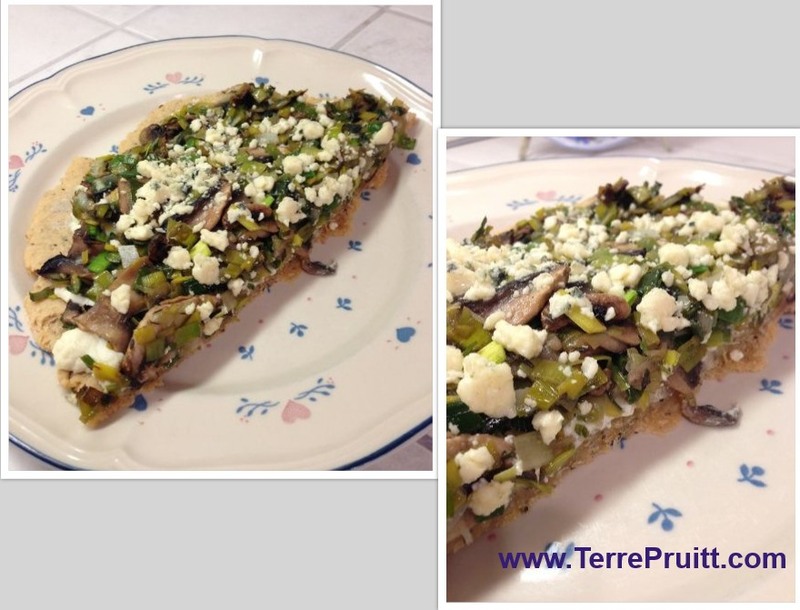 I loved the flavor as I did when I made the eggplant bruschetta. What I would do next time is use 3 tomatoes instead of four. The flavor of the tomatoes overpowered everything. I am looking forward to having the leftovers, as I believe left over pasta is often better than the freshly made dish. The flavors have time to meld. This is an easy dish, there is nothing complicated about any part of the process, but with all of the chopping it is a bit labor intensive. The separate roasting of the eggplant and tomatoes makes it a long process. I didn’t want to roast them at the same time. But if you chop while things are cooking . . . . . I will probably make it again. What about you? Does it sound good? Which of the vegetables is your favorite? Another quick post. I often have a vague idea of what I am going to cook for dinner then I forget as the day goes on. Either I am teaching Nia, learning a Nia routine, or at the moment going through my mom’s stuff. So I find myself walking into the kitchen and not knowing what to cook. Yesterday I was on the phone with my husband and it was already past starting-dinner-time and I didn’t even know what to make. I had purchased some ground beef but had no plan as to what to do with it and I had forgotten about it. When I looked in the fridge I saw it and the butternut squash I bought. Ooo! 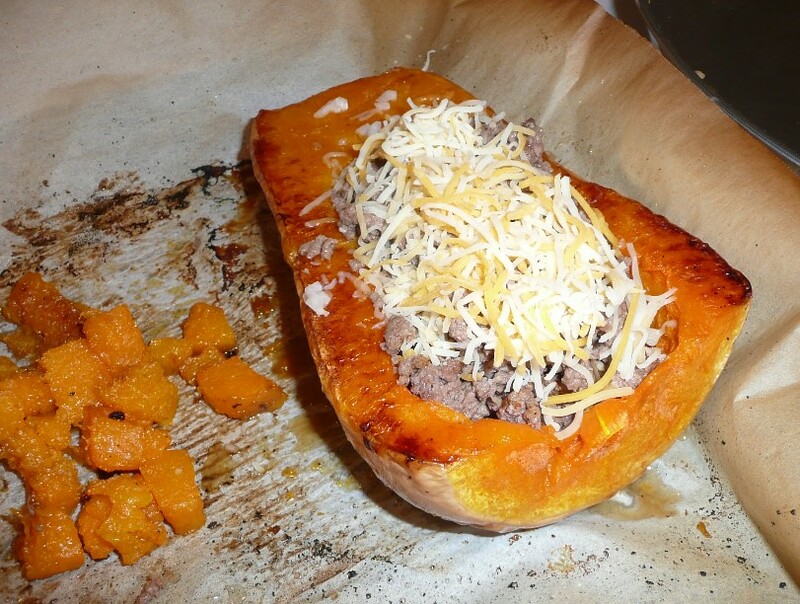 Stuffed squash. Actually it is more like Topped Squash. It is somewhat easy . . . except for making space in squash. I was trying to do it in a manner that saved the squash innards for roasting (perhaps you will notice the cut up pieces of squash in the picture). That was the difficult part. Needing so much concentration I forgot to take pictures. I emptied out the small portion where the seeds are (easy), but I wanted more room for meat (not so easy). So I cooked then cut (I would not recommend that). I would recommend just skipping that part and making room using a spoon before baking it. Preheat oven to 450° F. Cut the butternut squash in half lengthwise. Remove the seeds and enough of the insides to make a “boat” in which to place the beef. Coat both sides of each half in olive oil. Salt both sides of each half. Place each half face down on parchment paper on pan. Bake for 15 minutes. While the squash is roasting, heat the oil and onion. Once the onion is translucent, add the beef. Add the salt and garlic. Cook the beef until it is almost completely cooked. Add the pepper. When the first 15 minutes are done, turn the squash over and bake for another 15 minutes, salting again, at this time, if that is your preference. After the second 15 minutes of cooking . . . . check the squash. 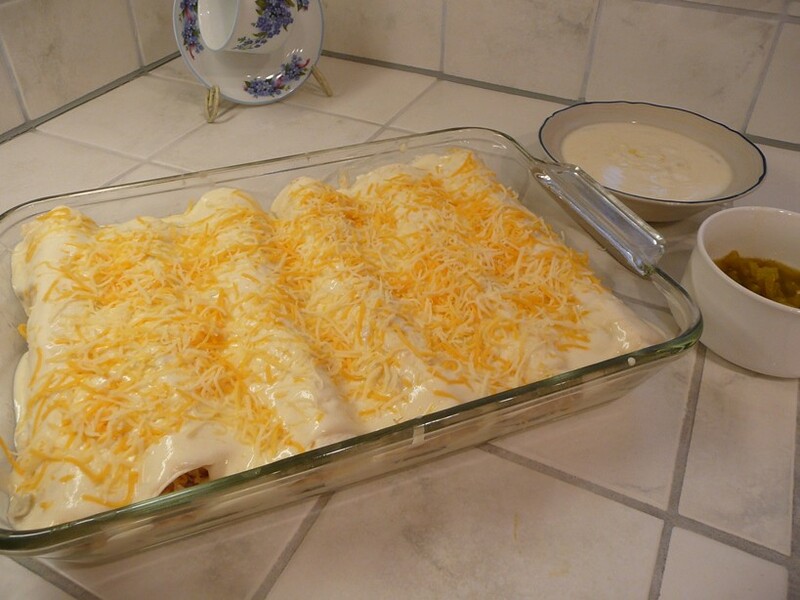 If it seems cooked all the way through, salt it again and then fill each half with the beef and top with shredded cheese. Bake until the cheese is melted. This is very rich and very filling. I didn’t think about how much this was like the stuffed pumpkin I once cooked. Although the stuffed pumpkin was much more “complicated”, as in it had more ingredients and a bit more complex flavors. This was very good, I thought. And since we usually eat ground turkey and not ground beef that much this was very rich. I feel that beef is more “rich” than turkey. It was very good. And, had I not been trying to save the portion of squash that needs to come out to make room for the meat it would have been easy. 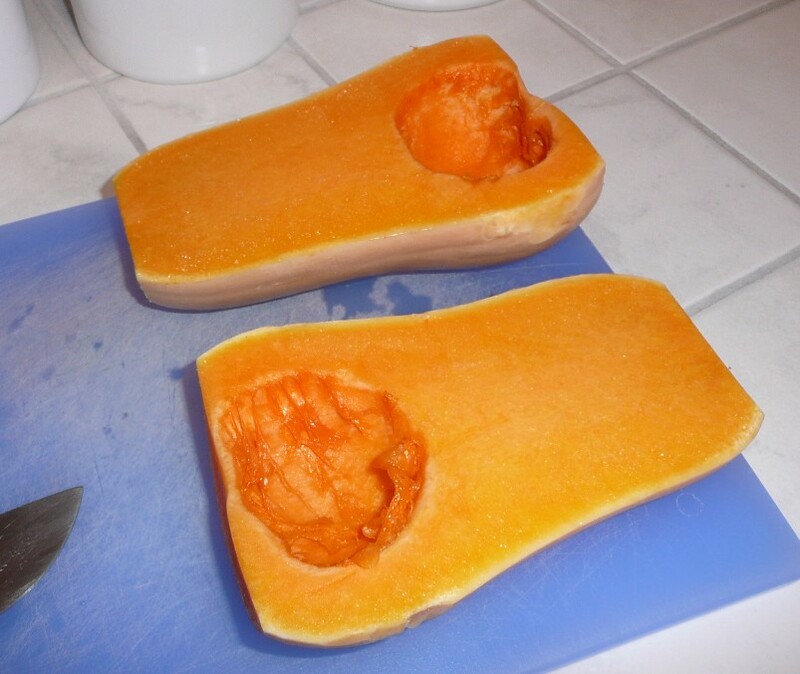 So if you are not interested in making nice chunks of squash to roast along side the halves this is an easy recipe. And very yummy and rich. Good dietary fiber! Do you like stuff/topped squash? What would you top yours with?